The architecture of Antoni Gaudí is commonly associated with the Art Nouveau movement of late 19th-century Europe. Perhaps this association is due to the exuberance of the forms and their capricious appearance, or maybe it can be attributed to the use of picturesque and natural motifs in combination with vernacular solutions. 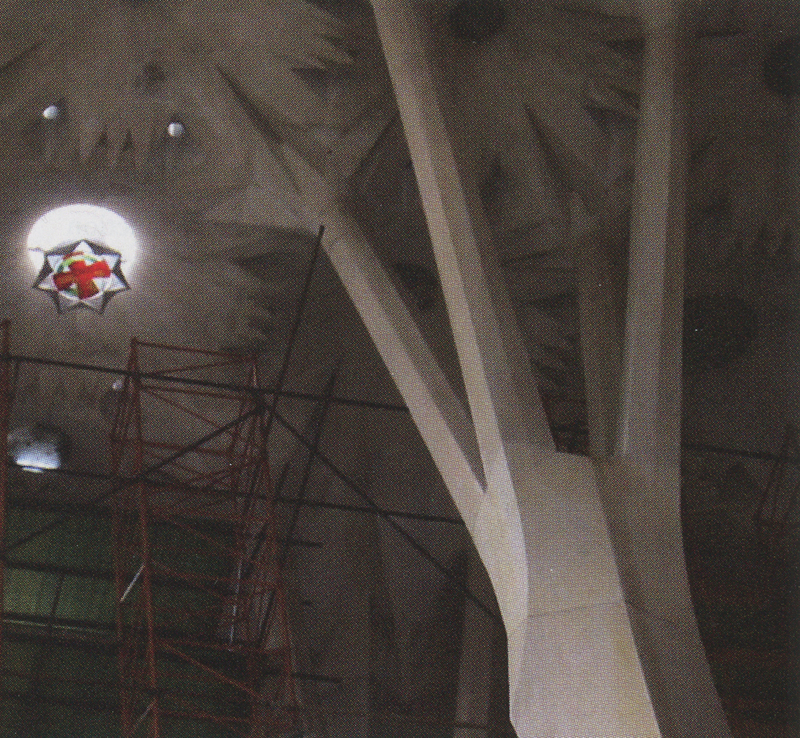 Some experts even regard Gaudí’s work as the precursor of Catalonian modernism. Nevertheless, behind the seemingly erratic appearance of complex forms and spaces, Gaudí’s work epitomizes the synthesis of plain shapes and simple geometrical operations. The interior and exterior of his buildings offer a collection of unique spatial experiences. His innovative architectural language is the result of a unique combination of geometrical operations most evident in his work on the Expiatory Temple of the Sagrada Familia in Barcelona. The Sagrada Familia, still under construction, started as a small parochial church of neo-Gothic style in 1862. The original architect resigned only a year after being commissioned and Gaudí was hired to complete the project and oversee its construction in 1863. Gaudí, known to have been a critic of the Gothic style, took a bold, ambitious approach, changing both the style and scale of the project. The Sagrada Familia became a project that consumed Gaudí for the next 43 years until his accidental death in 1926. He spent the final 12 years of his life declining other commissions and remained exclusively devoted to the completion of the Sagrada Familia. Most of the work was done in plaster models that still survive and provide documentation of the architect’s original vision. 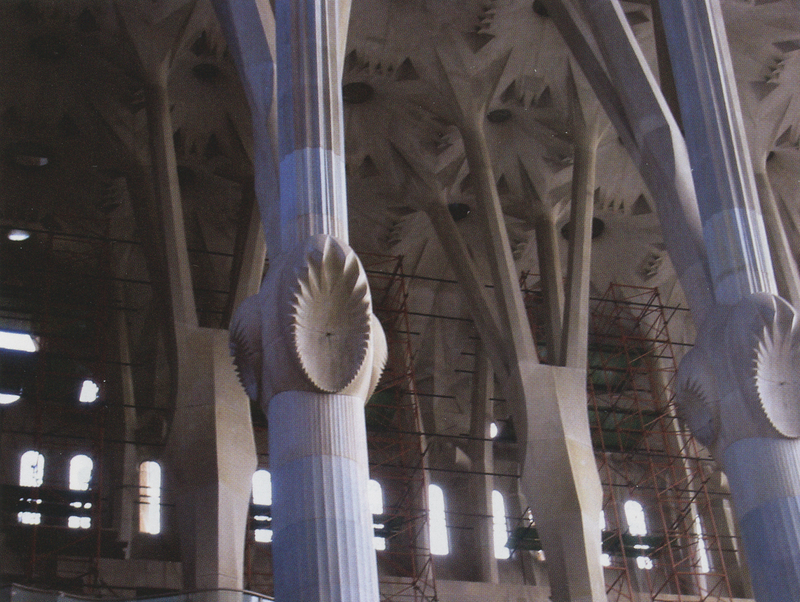 For the columns of the Sagrada Familia, Gaudí initially proposed a single helicoidal shape. However, he became concerned that the single twist was visually inappropriate, since it produced a column that looked weak and could be squashed or deformed when loaded to compression. The visual imperfection of the single twisted column bothered Gaudí for a number of years and inspired a search for an alternative solution. After years of experimentation, he applied two simultaneously opposite rotations. This approach, which has no known precedents in architecture, was the result of eight years of work and experimentation. Gaudí’s inspiration for the helicoidal growth can be found in plants; it is believed that he studied the growth of abelia, a plant abundant in Barcelona. The double-twisted column was based on a single rotation of a basic shape and the corresponding counter-rotation of the same shape. When the two shapes were superimposed and intersected, the resulting shape created a new emergent form. 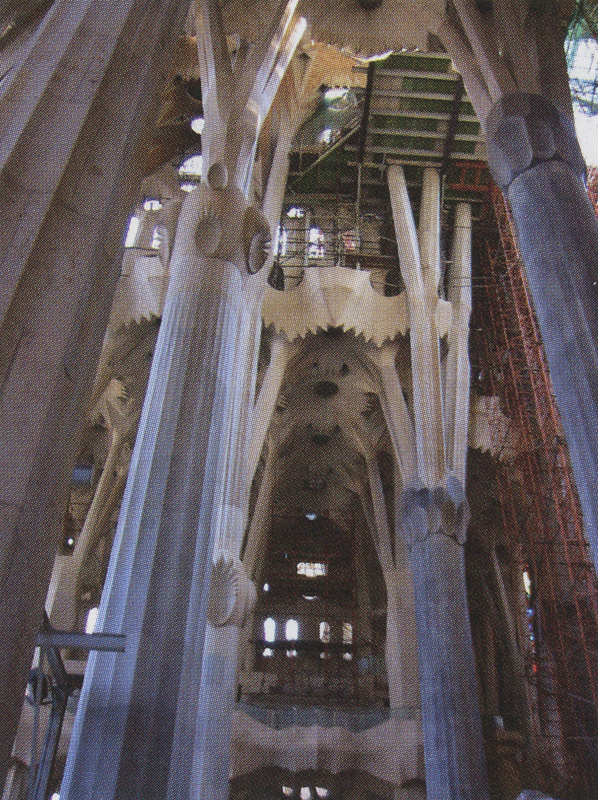 All the columns on the Sagrada Familia nave follow this process. The only variations can be found in the degree of rotation, the height of the columns, and the initial shape used to generate the columns. A hierarchical arrangement of the columns is present throughout the temple. The columns of the central nave use an octagonal shape; the columns of the crossing area are two pentagons forming a 10-sided polygon. The central columns on the crossing are three squares forming a 12-sided polygon and the columns of the lateral nave are made of two triangles to form a hexagon. With today’s computer-modeling systems, it is fairly easy to reproduce Gaudí’s original columns and to explore possible new designs using variations of the initial shape and degree of twist, as well as the use of irregular forms and non-symmetrical shapes.